Of all the actors from Hollywood’s golden age Robert Mitchum is surely the most charismatic and dangerous. He played criminals, private detectives soldiers and cops but always with an edge of knowing, sardonic humour and sometimes downright cruelty that marked him out from the other stars of the time. Two of his most memorable roles saw him portraying psychopaths – the vengeful ex-con Max Cady in Cape Fear and the self-appointed ‘preacher’ Harry Powell in The Night of the Hunter. In this film he is mesmerising – alternately charming and terrifying as he terrorises a family in his search for stolen money. The film is one of two important movies credited to writer and screenwriter James Agee – the other being The African Queen. The Night of the Hunter is the only film to be directed by the distinguished actor Charles Laughton. Laughton was a British born performer who is best remembered for a series of powerful character roles including Quasimodo in The Hunchback of Notre Dame. 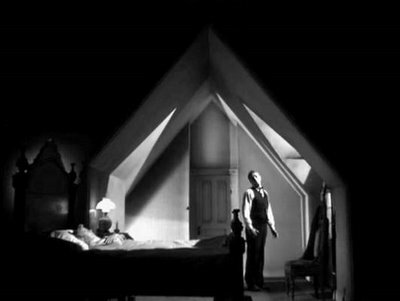 Working with cinematographer Stanley Cortez, Laughton gave Night of the Hunter a haunting expressionistic design reminiscent of the German cinema of the 1920s and 30s. The beautiful black and white photography gives the film a dreamlike tone, which makes it unique and vivid and has influenced the work of many modern directors including David Lynch, Terrence Malick and the Coen Brothers.